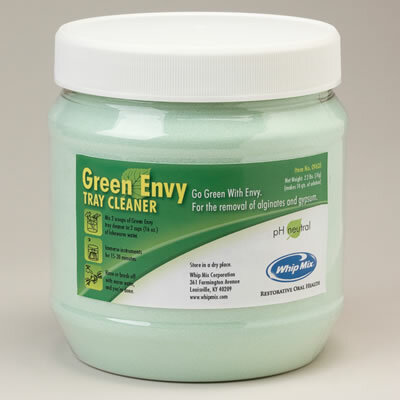 Green Envy Impression Tray Cleaner Whip Mix Green Envy cleans impression trays and instruments without harming the skin or the environment. Green Envy, from Whip Mix, removes alginate and gypsum from impression trays without harsh chemicals or toxic compounds, making it gentler for the user, and safer for instruments and the environment. The nontoxic, pH-neutral, biodegradable cleaner interacts with soils and surfaces rather than reacting to them with harsh chemicals, dissolving alginate and plaster residue naturally while eliminating the need to scrape and scour. Green Envy comes in a 2.2 lb (1 kg) jar that can clean up to 500 trays, double the amount of most similar products.